A classic, easy to make Mediterranean parsley salad mixed with cucumber, mint, tomatoes and Bulgar wheat. The ingredients can be prepared the night before you are expecting guests but never add the vinaigrette until just before serving. It's best to make the vinaigrette before hand as well to allow the flavours to mix, just keep refrigerated until you need it, insha Allah you will taste the difference. Suitable for vegetarians, paleo diet and enjoyed throughout the year as well as the summer. 4 batches of Parsley chopped very finely. - washed and chopped very finely. 1 bunch of fresh green mint leaves - washed and chopped very finely. 4 medium sized tomatoes - seeded & chopped as fine as possible. 1. When you rinse the veggies and herbs, it's important to pat dry and leave until completely dry, especially the parsley and mint that are the main ingredients. 2. Cut the stems off the parsley and mint then chop as finely as possible. (This may take some time but it pays off in the end). 5. Finely chop the green spring onions and mix with the sumac or Lebanese 7-spices. 6. Once you are ready to serve, add the lemon juice on top of the broadened Burghul and seperate it slowly with your fingers, then add the olive oil and salt all over the ingredients and mix lightly. Avoid over-mixing so that the greens stay as fresh as possible. 7. 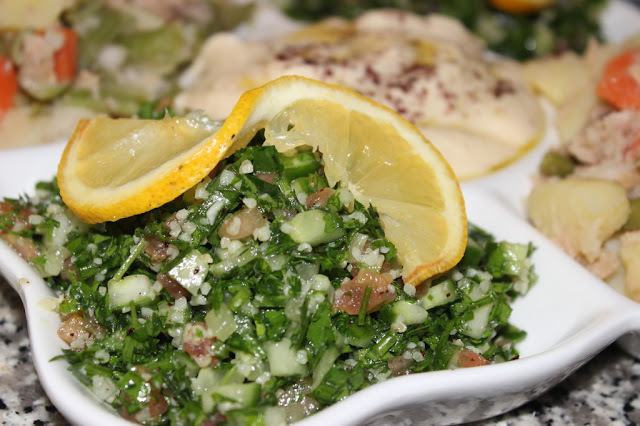 Tabbouleh is traditionally served on or beside a bed of lettuce, but feel free to present it however you like.